Distribution and habitat: Impatiens walleriana is native to eastern Africa. It was widely naturalized in other parts of the world such as North America, Australia and several Pacific islands. Grows in bushland, along water courses and shady wetland margins. It thrives in rich moist soil and prefers a shaded or semi-shaded location. It is a herbaceous perennial plant in its native habitat. 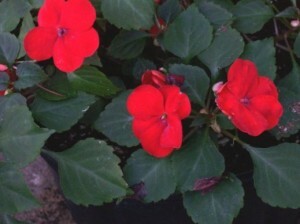 Description: Impatiens walleriana are bushy, succulent stemmed and almost perpetual-flowering. These plants were given their botanical name (Impatiens) because of the apparent impatience with which they discharge their seeds when ripe and their common names (Busy Lizzie) because of the persistence with which they flower. Impatiens walleriana is growing to 30-38cm (12-15 inch) tall, with broad leaves. Leaves are mostly alternate, although they may be opposite near the top of the plant. The flowers are profusely borne with five petals and a spur. The seedpod explodes when ripe, an evolutionary adaptation for seed dispersal. It is the tall, lanky ancestor of a vast number of hybrids that have all the good habits and one of the drawbacks of the species. Among the many hybrid strains of the Impatiens walleriana are plants with flowers of all shades of white, pink, red and orange as well as bicoloured and some kinds have more than a single layer of petals. Foliage may be elliptic or heart-shaped and coloured any shade of green with or without a bronze sheen and red or brown speckles on the underside. Seedlings begin to flower when they are 2cm tall and they rarely stop. Houseplant care: Modern hybrids of Impatiens walleriana are treated often as annuals and discarded towards late autumn when they begin to go out of bloom in average room conditions. If kept, they tend to become unsightly. Pinch back the plants to keep them bushy. Light: These plants should be subject to hot direct sunlight, but they do need bright light. Temperature: Normal room temperatures are suitable, but at temperatures about 24°C (75°F) these plants like high humidity. Place plants on saucers of moist pebbles and mist-spray the plants daily. No Impatiens walleriana will tolerate temperature below 12°C (54°F). Water: Water them moderately, allowing the top centimetre (04. inch) or so of the mixture to dry out between waterings. Never permit pots to stand in water. If the amount of light reaching the plants is reduced, they will enter a rest period, when they should be watered more sparingly, allowing the top third of the potting mixture to dry out between waterings. Never let the mixture dry out completely. Fertilising: Apply standard liquid fertiliser every two weeks throughout the active growth period. Potting and repotting: Use a soil-based potting mixture. Move permanent plants into pots that are one size larger when the pots become full of roots. A 13cm (5 inch) pot should normally be the largest size required. 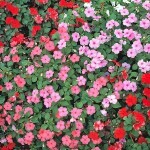 Garden Culture: Plant the impatiens in the early spring, just after the final frost in temperate zones. Pinch off all the plant’s blooms one week after planting to encourage branching branching and increased blooms. Position: Select a planting location that provides partial-to-full shade. Keep Impatiens walleriana out of direct sun. These beauties prefer light to medium shade. 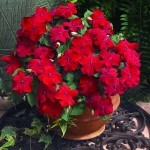 Soil: Plant the impatiens in well-drained, organically-rich soil. Mix the native soil with an equal amount of peat compost. Plant the impatiens about 15cm (6 inch) apart to promote taller plants. Position the plants 20 to 25cm (8-10 inch) apart for bushier spreads. Water: Water the impatiens regularly, providing 1 inch of water per week. Adjust the watering schedule for varied weather conditions. Increase the schedule during hot, dry summer months. Decrease the schedule during periods of rainfall. Do not overwater. Fertiliser: Use slow release fertiliser Water it in thoroughly. Repeat the application once in early summer. 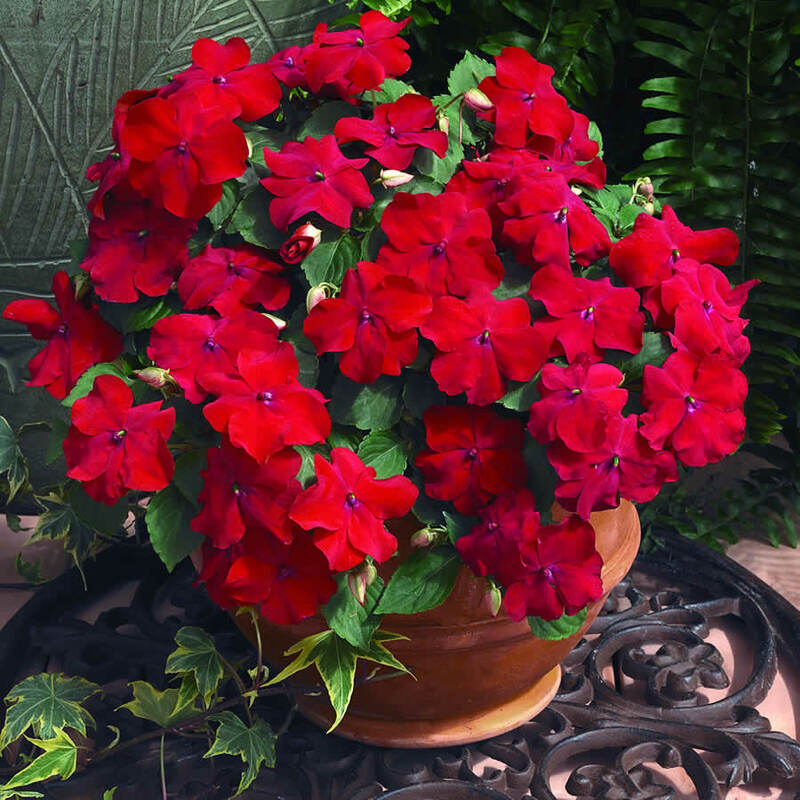 Feed outdoor container of Impatiens walleriana with a liquid fertilizer once every two weeks throughout the growing season. Propagation: Impatiens walleriana can be grown from seed sown in shallow trays of rooting mixture of equal-parts mixture of peat moss and sand or perlite early in spring. Enclose trays in a plastic bag and keep them in bright filtered light at a temperature of 18-21°C (64-70°F). When plantlets are about 4cm (1.5 inch) high, carefully transplant them into small individual pots filled with soil-based mixture. Plants will generally begin to flower after about six weeks. During the summer, however, tip cuttings 5-8cm (2-3 inch) long can be rooted in water and transferred to soil-based mixture when roots a centimetre (0.4 inch) or so have formed. Or cuttings may be planted directly in an equal-parts mixture of peat moss and sand or perlite for later transferal to soil-based mixture. Treat well-rooted cuttings as mature plants. Wilting, falling leaves are the result of lack of water. Rotting stem are the consequence of overwatering. Treatmeant: Never allow the plants to stand in water. Spindly growth is caused by too much warmth and inadequate light; plants are naturally become leggy with edge. 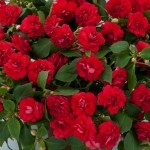 Treatment: Take cuttings and discard the old plant. Poor flowering is caused by over-potting. 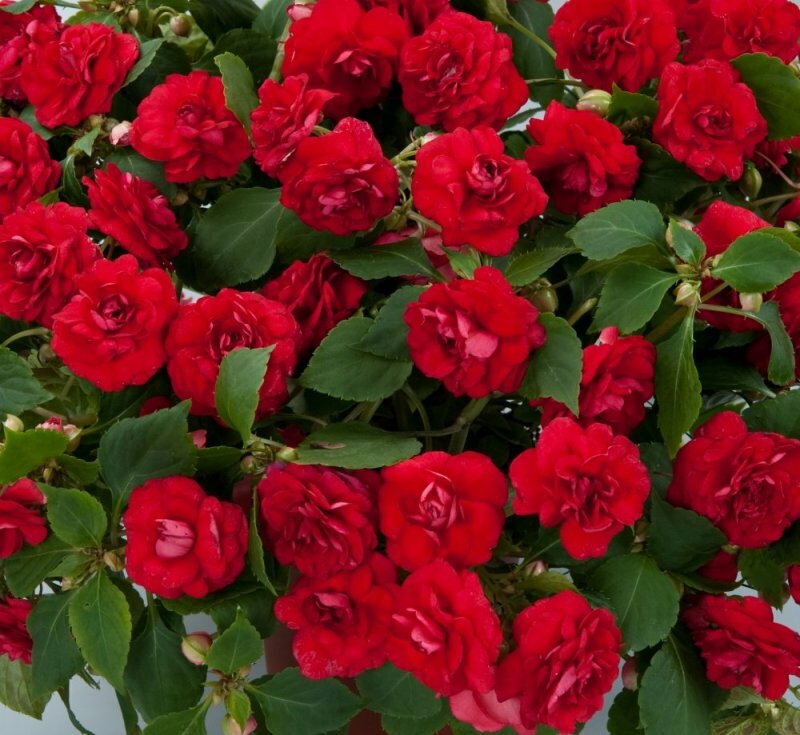 Loss of flowers is normally due to lack of light, but dry air, underwatering or attack by red spider mite will have the same effect if growing conditions are poor. Hot, dry air and exposure to full sunlight may encourage red spiders mites. Treatment: Daily mist-praying may help ward off attacks. Cut away badly infested leaves and adjoining stems and spray plants with an appropriate pesticide. Repeat the treatment after 3 days and again 10 days later. If mites persists, tray a different pesticide. Watch out for aphids and whitefly. Treatment: Remove and destroy badly infested plat growth. Keep plants clean at all times and use an adequate pesticide regularly. Notes: Impatiens walleriana is regarded as an environmental weed in parts of Australia where was naturalized. Availability: Impatiens walleriana is available as potted flowering plants or as seeds. Seeds are usually sold in mixed or separate colours; the selection is given a name describing the attributes of the stain. Uses: Impatiens walleriana is commonly cultivated in parks and gardens, typically grown in containers but also in bedding schemes. Mass in shady beds, borders and woodland gardens. Ground cover. Edging along walks or paths. It is used in Courtyard Gardens, Cottage or Informal Garden designs. Containers, window boxes and hanging baskets. Houseplant as annuals or as living indoor decor.